*Reflection* Think about your story and perhaps learn, or at least try, to be grateful and know that the bad that happened kept the worse from happening. *Reflection* How do we live fully so we are fully ready to die? *Reflection* Do we know those who are born-again but not yet born-anew? *Reflection* What joy-wonder means to you. *Challenge* We must DO something to quench thirst. *Often people are changed or challenged to change after a great and sorrowful event. We begin exercise programs after receiving a bad cholesterol result or worse, suffering a severe heart attack. We become more thankful after losing something that perhaps we took for granted. We become more humble when confronted with our own prideful self. *Challenge* The naming of moments. Do this every day. Only God can make time; we can either take it, lose it, or watch it slip by. *Challenge* Explain how and when and why your moments of living life amateur. *Reflection* Lunch with the children and the chocolate melts. Voskamp enters fully in the moment. *Challenge* Remember a time when you fully entered a moment of special time. Chapter Five – what in the world, in all this world, is grace? notes of my life into the song of His Son? *Reflection* We all have had seasons of hard eucharisto; or, we will have. During those times how did God demonstrate His grace toward you? *Challenge* Lamentations 3:31-33 states that the Lord causes grief – yet shows compassion. He does not afflict willingly nor grieve willingly. Do those scriptures bring upset or peace to your soul? *Reflection* Living with our eyes wide open. Eucharisteo is in the seeing. *Challenge* How do I look at everyday things? All the minutiae of everyday living? *Challenge* Practicing eucharisteo when you don’t really “feel” like it. You cannot positive think your way out of negative feelings. The only way to fight a feeling is with a feeling. Feel thanks and it is absolutely impossible to feel angry. Tear the thigh to open the eye. *Challenge* The next time you feel real anger at something or someone, stop in your tracks and purposely practice eucharisteo. Turn the feeling of anger into a feeling of gratefulness. Chapter Eight – how will he not also? God and I, we’ve long had trust issues. *Challenge* Confess to God your trust issues. *Reflection* Has prayer been replaced by worry in your life? Fear keeps a life small. Stress isn’t only a joy stealer – the way we respond to it can be sin. Thanks is what builds trust. The hopes don’t have to add up – the blessings do! *Reflection* Humility is the greatest virtue! *Question* Can we really expect joy all the time? Only self can kill joy. I am a flame to light other flames. *Challenge* Being willing to share your flame. *Reflection* The Yonge Street experience is a very powerful testimony of raw eucharisteo. How would we respond in a similar experience? Eucharisteo means to give thanks and give is a verb, something that we do. God calls me to do thanks. To give the thanks away. *Challenge* Accepting and believing God loves us no matter what and then, because of that love, trust Him. What a burden I thought I was to carry – a crucifix, as did He. 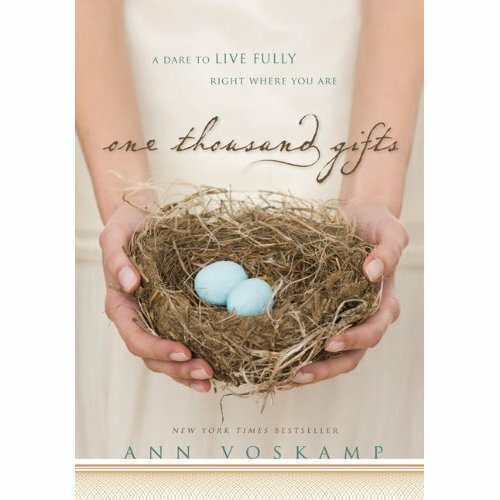 I’m having a difficult time finding book club study questions for the One Thousand Gifts book that we recently red. I hope you can assist me. Carol, I may have some I will email them to you!